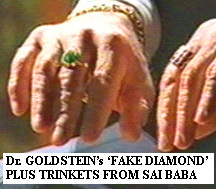 All proof that any of the 'gemstones' in Sathya Sai Baba rings are genuine is completely lacking, while proof would be easy to obtain from any fully accredited diamond expert. Yet none has ever been forthcoming! 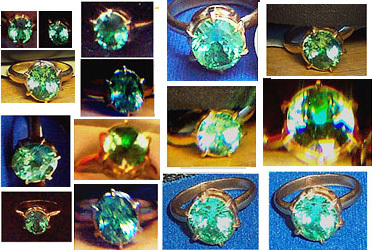 On the contrary: when Queen Margarethe of Denmark’s personal jeweler, Mr. P. Hertz of Copenhagen, examined my supposed ‘green diamond ring’, he said he could not be entirely sure that the green gem (about 5-6 carats) was a fake unless he could open the 18 carat gold casing in which it was set so that the rear of the stone was concealed. When I allowed this, he found the stone to be a synthetic sapphire (originally worth about US $10 or so at the time in India – or perhaps even less, since such stones are now being advertised on the Internet for tiny sums). It’s brightness had been enhanced by a piece of greenish tinfoil behind the stone, protected by the rear casing. (The professional assay was photographed, see here) The tinfoil was arranged so that the appearance of a vague silhouette of a head would appear in the stone when seen from certain angles (as seen in the images above). One can just about imagine it is Sai Baba’s fuzzy head. (However, devotees are experts at imagining he is everywhere and miraculously omnipresent etc. which influenced my mind for some time until I studied how it was a reproducible effect with the correct shading and light. That the stone is a fake conflicts totally with what Sathya Sai Baba let us understand about it when he gave it to me at an interview on Dec. 23'rd, 1986. It was something for which I never asked, but to refuse in that situation was unthinkable. No more, however! Devotees said it was such a great honour and - until that time - very few persons had been given such large 'green diamond' rings. Among those few who had were: 1) the former and subsequent International Chairmen of the Sathya Sai Organisation, Mr. Indulal Shah and Dr. Michael Goldstein 2) The Head of Administration at the Vidyagiri ‘deemed’ University - Mr. Kanhaia Jee, 3) Mr. Victor Kanu, who runs an authoritarian Sai school in Zambia, and 4) Mr. Robert Bruce 5) Professor Keith Crichlow 6) Mr. Antonio Craxi (Apropos, Mrs. Craxi stated the opinion that green rings are "power rings”. But her husband was unable to help keep his brother, Bettino Craxi, in power, not with the help of his ring (nor with their Mafia connections, for that matter.) Mr. B. Craxi, who visited Sathya Sai Baba in Puttaparthi while he was Italy's Prime Minister, died recently as a criminal in exile in Tunis, fleeing a conviction in Italy to about 18 years in prison plus massive multi-million dollar fines. Another giveaway that these alleged “diamonds” are not real is the wear and tear they mostly show after being worn for a few years. I saw this on the green gemstone of Mrs. Maynard Ferguson, which was scratched so much (from washing up, she said) that it was very dull. Those green stones which are synthetic sapphires are, however, very hard and are less prone to damage being somewhere near as hard as diamonds. Diamonds NEVER scratch (unless sometimes under much pressure by other diamonds), but they can chip and shatter if hit hard, and tiny bits can fracture off around the edges. (See documentation here). 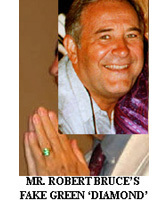 Alleged 'green diamond' stone given to Robert Priddy Dec. 24th 1986, and seemingly 'materialised' by Sathya Sai Baba. Later proven to be a cheap synthetic sapphire (see here). Also a silver medallion given to Mrs. R. Priddy likewise. 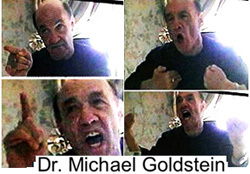 See another video with Dr. M. Goldstein, the totally deluded man -the only kind Sai Baba likes! 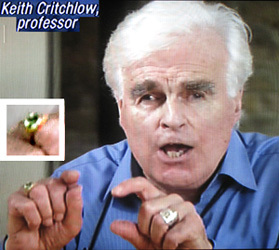 A former follower, Mr. Greg Gerson, (MA in East /West Psychology) of Houston, Texas, who studied under Arlene Mazak Ph.D., former award-winning Fulbright scholar and later a professor of Hindu studies who conducted him on a tour to visit Sai Baba, reported to me: "I stopped wearing the green gem ring Sai Baba “materialized” for me in November of 1996 on my third visit after discovering its being fake. But to be honest, my brainwashing was so strong; I still sometimes wore it on a chain around my neck as recently as 2000. 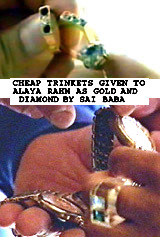 A main reason I was so reluctant to remove the rings Sai Baba gave me, especially the silver ring with his face was that I had read and was told many times by devotees that rings (and other "materialized" objects) given by Sai Baba were talismans which would protect the wearer from harm. I very much wanted this to be true, that Sai Baba was watching over me and protecting me from harm. 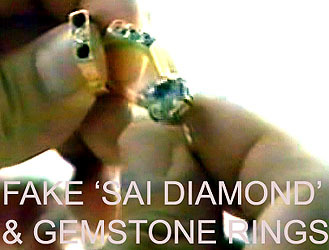 In addition, Sai Baba told me that the green gem ring would give me "peace of mind". Arlene Mazak, Ph.D., USA signed the petition calling for official investigation of Sathya Sai Baba, as followsa. I visited the ashram a number of times, and had nothing but inspiring experiences. My relationship with Sai Baba was entirely on the inner plane, with psychic experiences.. When I learned of the extensive allegations, I severed that relationship. The spiritual abuse is immense. The truth must be revealed through an official investigation. Pedophilia is very serious abuse, and I am a mandated reporter in my profession.